It’s great that you understand you need to train regularly if you want to achieve maximum health and be the best athlete you can be for your sport or sports. But although you might have dedicated yourself to training, are you sure you maximize your workouts? If you took more than one second to answer that question, review this list of tips so you can know and be confident you’re giving all you can to the weights and getting the best benefits possible from them. Athletes can’t simply go through the motions when training. One key to having a great workout is to make sure you’re ready for it. We are all busy and have many things going on at once. If you’re focused on those things and not paying attention to the upcoming session, the workout won’t be productive. Around one hour before go-time, start planning what you’re going to do and getting yourself psyched up for it. Be excited and ready when you lace up your training shoes and prepare to walk into the weight room. This is something you hear or read about a lot, but it bears repeating. A thorough warm-up period serves many purposes. It gets blood flowing, raises body temperature, lubricates the joints, and helps you lock your focus in on what’s about to go down. It can be as brief as five minutes, but taking this time to warm up can lead to a very productive hour of training, which can lead to better results in the long term. 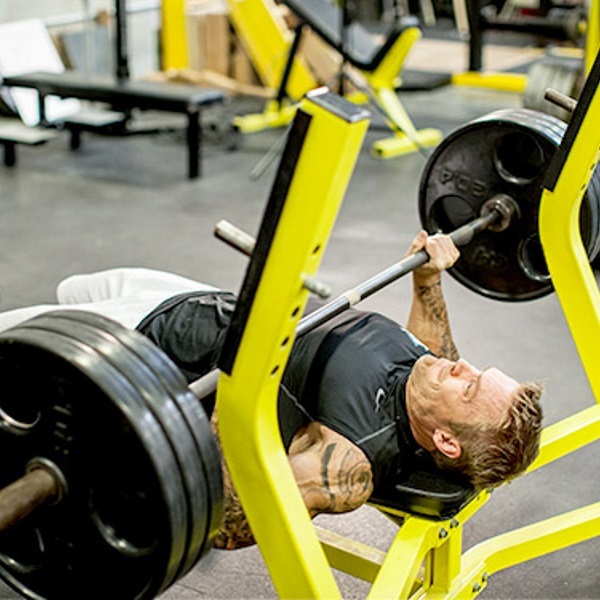 If you can bench press 225 pounds for three sets of 10 reps, why would you do that same thing every time you train. You won’t improve by staying in the same place. Go for 12 reps or add 5 pounds and try to bench 230 for the same sets and reps. Challenge yourself every workout so you can get the results you want. Whether it’s more reps, more weight, or less rest between sets, any improvement is a good improvement. It can be easy to fall into the trap of lifting the weight and counting. Although your heart is in the right place, your mind isn’t. If you want each rep to count, you need to perform it to the best of your ability. Execute each rep, keep cheating to a minimum, squeeze the training muscle every time, and lower the weight slowly so you can tear down those fibers as much as possible. This is vital if you want to take advantage of the last step. The moment you finish your workout, you should start thinking about recovery. Have your recovery drink with you in the weight room so you can start consuming it immediately. Stretch out to make more room for nutrient-rich blood to get to your muscles, take some deep breaths to bring in more oxygen, and mentally unwind so you can go about your day knowing you got a good session in. You should also know what recovery meal you will have when you get back home.